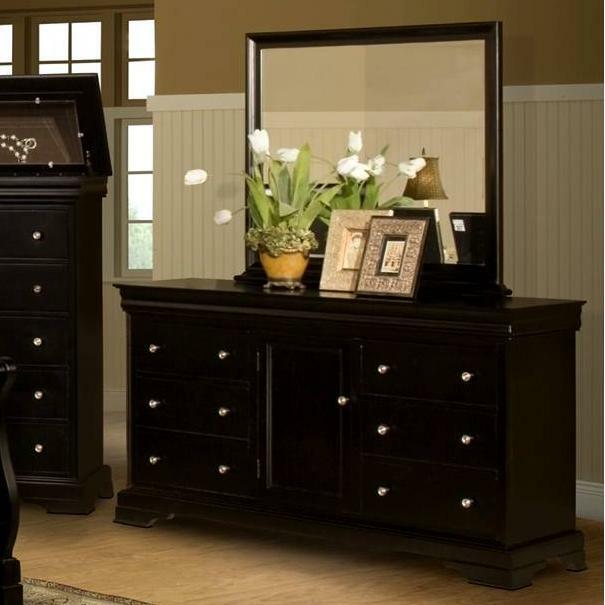 A beautiful dresser and mirror combination is the perfect way to add a beautiful and elegant look to any bedroom. You can do just that with this charming dresser and mirror pairing. The Black Cherry finish and sleek design gives it a stunning, sophisticated appearance. The dresser features six spacious drawers with silver-finished hardware, for clothes, jewelry, accessories, or other items. Between these drawers is a door with an adjustable shelf behind it. The landscape mirror has a matching frame and beveled glass, adding a lovely finishing touch to this dresser and mirror combination. The Belle Rose Six Drawer Dresser and Landscape Mirror Combination by New Classic at Darvin Furniture in the Orland Park, Chicago, IL area. Product availability may vary. Contact us for the most current availability on this product. The Belle Rose collection is a great option if you are looking for Transitional furniture in the Orland Park, Chicago, IL area. Browse other items in the Belle Rose collection from Darvin Furniture in the Orland Park, Chicago, IL area.